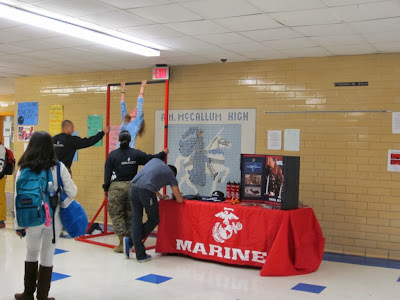 As Tami and I set up our SOY table at McCallum HS today, who should walk in but two Marine recruiters, who set up their chin-up bar and display right across from us! We have never had a school schedule us on the same day as recruiters except during career fairs, so this was s first! It proved an interesting day. Although there were several students who tried out the peace wheel or stopped to check out our materials, two more extended conversations stand out from today. One young man stopped to ask about our group, and after my brief description, told me that his grandfather was a soldier in the Vietnam War. He started by referring to his grandfather's mention of 'hippies demonstrating" against it. I then asked if his grandfather talked about any trauma from the war and he responded that his grandfather cries about the women and children he saw killed. We continued with my sharing about reading of the emotional pain that soldiers who were in Iraq and Afghanistan felt about the same kind of experiences being involved in the deaths of civilians. I mentioned one I had read about cars that didn't stop at blockades (to stop suicide bombers) and people inside being shot, only to find that they were innocent people. One example I recalled was a husband rushing his pregnant wife to a hospital. I also commented that there was a draft when his grandfather been in a war, but now young people have a choice. I then asked about his grade level (11th grade) and his future goals. 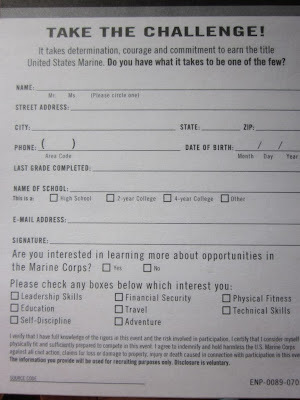 He said he "might" (his emphasis) join the Marines. I asked what he would like to do after that and he said he wants to be an architect for houses. 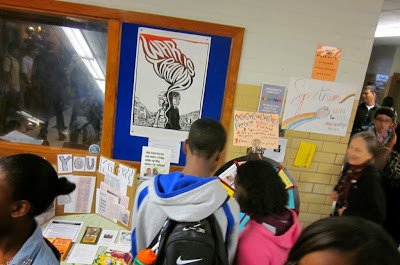 I pointed out our Americorps brochures as another way to pay for education. He didn't take one but did look at some of our literature. 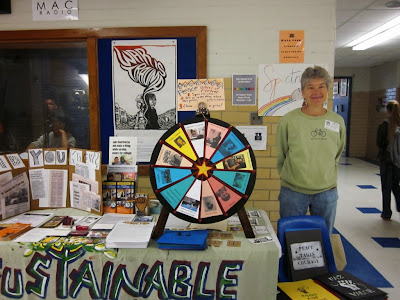 The other conversation was with a female student who turned the peace wheel and landed on the one in which they are asked to name a peacemaker they know of. She spoke of looking up Tiananmen Square after the recent car bombing there and learning about the 1989 protest there and a woman who was one of the organizers. She couldn't recall the woman's name but said she is now living in New York and working for Chinese women's rights, particularly in regard to the one child policy. As Susan will describe more fully, the Marines recruiters were across from us and had quite a few students trying out their chin up bar. We brought ours in, put it together and attached our sign that said "There is strong .. and then there is peace strong." Even though no students tried out our bars, several did stop to comment that they liked the words in contrast to the ones used by the recruiters. I am sorry to say that the Marine recruiters had more business at their table than we did at ours. Today, we especially needed Ben and Hart! The good news is that Hart is back in Austin and hopefully can join us again soon, and we hope that Ben can, too. We introduced ourselves to the recruiters and invited them to look at our things. They were polite but cool. One of them was a graduate of Lanier HS, and she had learned to be a radio operator in the Marines. The other said he had earned a degree online and also was earning college benefits for his young son. Both of them said that they have had good experiences in the military. I heard them stressing to students that Marines do humanitarian assistance after disasters. One of the recruiters said she had done so in Haiti after the earthquake. As we were packing up, I gave each of them a “Peace Takes Courage” sticker and invited them to join our group when they left the military. I was sincere, but they didn’t respond positively. Yesterday was Veterans Day, and it is a day that always makes me feel very sad. It makes me wonder if we will always have wars and so much man-made hurt. 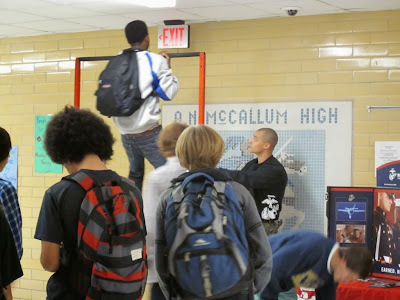 Seeing the recruiters attracting so many kids (both young men and women) to their chin-up bar was depressing. What experiences, I wondered, were they choosing to keep quiet about? Were they really as gung-ho about the Marines as they were paid to appear? As we left the school, I saw a student sitting on a bench curled up in his hoodie. When I asked him if he was OK, he responded with a growl. I have to say that I was feeling kind of the same way.